Green Pond Water, UV Clarifier . The picture above albeit two different ponds demonstrates what is clearly the more desirable pond. There are many causes and cures to this problem, however the use of a correctly applied UV Sterilizer/Clarifier is the most simple and popular, of which the correct application is the focus of this article. Green water is caused by the accumulation of millions of single cell, microscopic spores of green algae suspended in the water. These single cell algae have the ability to turn your originally clear pond into what looks like pea green soup. The main causative agent to green pond water is the sun. Sunlight while in itself is necessary and healthy for life (such as Redox), excessive exposure can and will cause algae problems. The result is what is referred to as an "algae bloom" is when single cell green algae reproduces at a fast rate, as a result of sunlight and nutrients in the water. Outside of shade by both or either plants or overhead trellises, not much can be done about sunlight (although seasons have a major impact on sunlight since the winter sun does not have nearly the impact of the summer sun, especially in higher latitudes). Nutrients are the other primary causative agent, which in itself can have many causes from high fish bio load, poor filtration, accumulation of decaying organic matters, etc. Good and regular maintenance can control decomposition of waste, while adequate filtration, especially a Veggie/Bog Plant Filter can help greatly by reducing nitrates in the water. Often many basic methods still fail to control these algae blooms and this is where a UV Sterilizer (as well as UV Clarifiers) comes in. with flow rate, this should be under 50 gallons per hour per watt of UVC for most Compact UVsand as low as 40 gph per watt for many low end Basic UV Clarifiers that utilize poor dwell time and low output medium pressure UV Bulbs. With higher dwell time "True" UV Sterilizers this rate can be as high as 60-70 gallons per watt of output UV energy (a "True" UV Sterilizer is one that maintains level one UV Sterilization or higher versus the many low end units often sold on eBay, Amazon, etc. that are only capable of basic clarification). It is noteworthy that generally straight tube designs have a higher dwell time. Turnover is sometimes tricky with pond as although it does not need to be high for Green Water control (Once per 2-3 hours), the shape of the pond and more often, flow patterns may not allow for coverage of the entire pond. What I mean is unlike most aquariums which tend to have relatively even circulation; many ponds may have one zone that has good circulation and another that does not. The result is an area of the pond with poor circulation, along with sunlight and nutrients resulting in these green water producing algae spores. 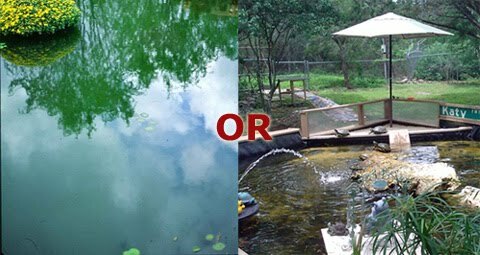 The solution, especially of you have a pond shape with more than one interconnected pond, is separate pumps/filters with separate UV Sterilizers. As well, the use of Veggie/Bog filter as mentioned earlier (especially in areas of constriction) can lower nutrients so that the UV Sterilizer does not work as hard. I would add that even with ponds in more formal rectangle or similar shape, separate flow patterns may still yield best results. If one UV (with proper flow/dwell time) is not sufficient, adding another immediately in-line can improve results. However I will still state from my experience two separate UVs will often yield better results than two in-line. An example would be the use of one 30 Watt AAP/TMC PRO UV Pond Clarifier (which is one of the best if not the best) for a pond up to 7000 gallons run with a flow rate of 2100 gph. This is clearly at the edge of this UVs operation envelope and although it make work well with optimum conditions (including a Veggie Filter), under other conditions such as high bio loads and considerable direct sunlight the addition of a second UV either in parallel on another pump (recommended) or inline on the same pump. Another idea for larger ponds in particular, is the use of large professional hard plumbed UV Sterilizer where by the water is split to different locations after passing through the UV Sterilizer to provide more even circulation. Of course a large UV Sterilizer can also be used on multiple lines for exceptionally large pond or ponds that have high sun exposure with marginal bio filtration (although I still recommend a Veggie/Bog filter for any pond, no matter how large, as a UV Sterilizer should not be your only algae/green water control tool). Easily the most exceptional high capacity professional UV Sterilizer for "hard plumbing" into one's pond is the TMC 110 Watt Professional Large Pond UV Sterilizer. 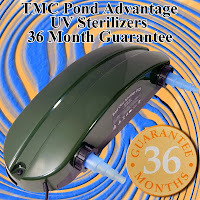 Quite bluntly in my 35 years of professional pond design and maintenance, I have never found a more efficient UV sterilizer AT ANY PRICE (often I have spent much more for lesser results). This is important too, you first want to remove as many dissolved waste particulates from the water as possible as these can and do block UVC irradiation, making your UV Sterilizer less effective. This is done by pre-filtering the water prior to entering into the UV Sterilizer, even if by just small sponge filter, gravel rock filter, etc. Another essential of placement is to make sure that the pickup of the water to the UV is not close to the return, so as to provide as best of over all circulation as possible. One can also install two (or more) smaller "loops of water" with multiple UV Sterilizers for better circulation with larger or irregular shaped ponds. Finally as per choosing a UV sterilizer, I will admit my bias, if it was/is not already apparent, and that is for the TMC Advantage professional line of UV Sterilizers. I have been in the business of professionally maintaining ponds and aquariums since 1978, specializing in UV-C Sterilization. I have tested and used most every brand and type of UV Sterilizer, I have even built my own from scratch. As well I have used and tested many brands of UV Bulbs for these units from cold cathode to superior Hot Cathode UV Bulbs, finding these albeit more difficult to light due to requirement of a peak voltage ballast, but vastly higher UVC output resulting in better sterilization and clarification (95% for the hot cathode versus 25% UVC output for the cold cathode). My point is I have found the construction of the TMC Advantage UVs very solid and durable with flow/dwell time patterns second to none including often higher priced Aqua, Emperor, and Laguna UVs. Just as importantly, when replacement parts are needed, TMC makes most all part easily available and reasonably priced; which I cannot say is the same for most other popular UVs. 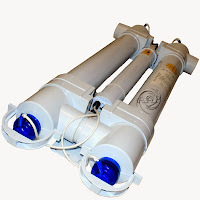 Then there are all the submersible UV's such as the AquaTop that while I have used them, with some success; these ultra low cost UV's simply do not hold up long term in a harsh pond environment and eventually fail. As well these UV's often cannot clear green water unless conditions are otherwise optimum. In summary when choosing a true level 1 capable UV Sterilizer over a low cost UV Clarifier, one might ask why bother spend the extra when all that is desired is clarification?? The answer is simple; a True level 1 capable UV can clear water at much higher flow rates, much more quickly sometimes in hours where as a UV Clarifier will often require days for the exact same pond!! As well, the level one capable UV will improve Redox, which improves fish & pond health, and aid in disease prevention; something a UV Clarifier CANNOT perform. Finally, many true UV Sterilizers are simply better built, which means you will likely get many years of service versus just one or two which is common to many of the lower quality UV clarifiers, including some of the more over rated models such as the Turbo Twist.